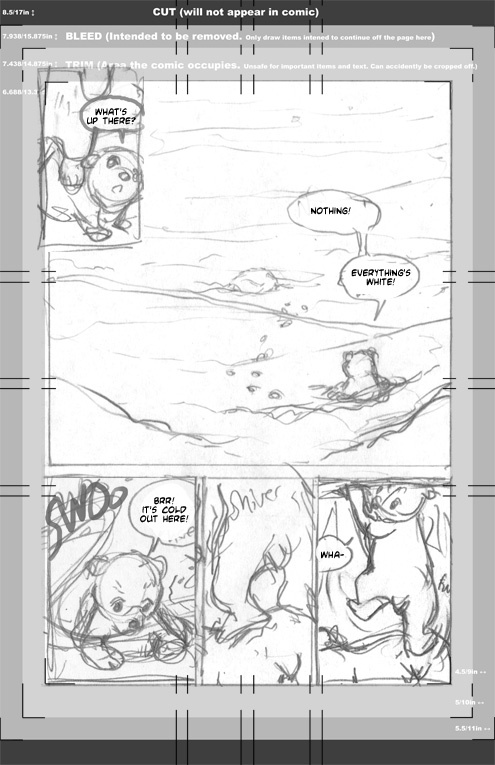 I’ve finished scanning and compiling the roughs for the first chapter of The Last of the Polar Bears, so I thought I’d talk a bit about my storyboarding process. 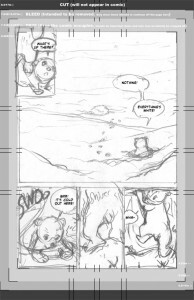 Because I am both the writer and the artist, I bypass the step of writing a traditional script for The Last of the Polar Bears, and work straight from a detailed synopsis to rough thumbnail pages. This allows me to be very flexible with my roughs. I read over my synopsis, then visualize the look of the pages as thumbnail drawings while I’m breaking down the actions panel-by-panel. In this way, I can quickly discover whether scenes that are easily described in text work visually, and make necessary corrections. I breakdown this description into a list of panels, each with a short description of what I want to bring to the attention of the reader. 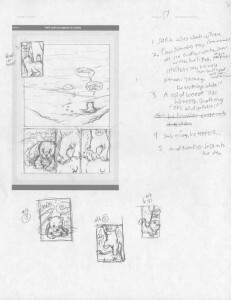 My thumbnail page layout (template here) measures 4″x6″ on an 8.5″.x11″ page and contains pertinent information such as trim and bleed so that I can plan out the overall look of the page along with composition, actions, and word balloon placement. Sometimes the pages come together in a very straightforward fashion. Sometimes I’ll end up trying multiple panel configurations. On page 17, you can see that I’ve come up with alternate takes for panels 1, 3, and 5. Once the thumbnails are drawn, I scan them into the computer and assemble the pieces. Here’s how 17 and 18 currently look. 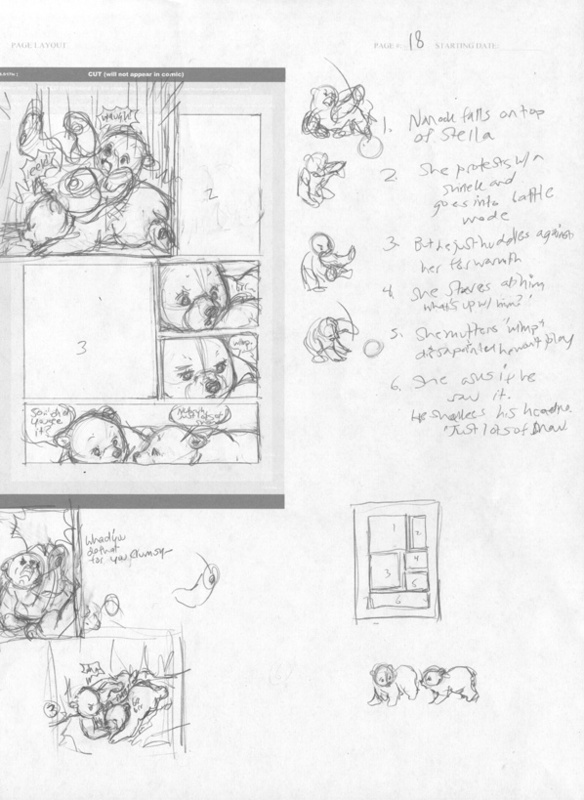 These thumbnails are my roadmap for the next step: penciling the pages at full size. With composition and content of the panels figured out, I’ll be able to turn my focus to drawing the characters tighter, cleaner, on model, and anatomically correct (to name just a few of many things I’ll be keeping in mind as I work through the pages). 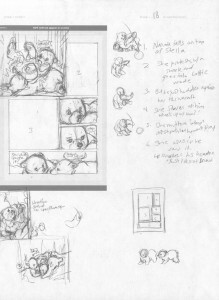 I’ll continue to delve further into aspects of my comic creation process in upcoming blog posts, so stay tuned for more. Our friend FRANS* from the NETHERLANDS has introduced your site to us. “We” that’s a whole bunch of polar bear lovers, mainly KNUT-fans in Berlin. I personally like best your studies! Wonderful! Congratulation. Wishing you success with your book projects.